Last year, a particularly frustrating experience in Zara’s Oxford Street store lead me to write this article, praising retailers who – in contrast to the Spanish retailer – typically excel when it comes to their in-store customer experience. Since that time, it appears Zara has undergone quite a few changes, largely through an increased investment and focus on technology. From this it aims to offer customers a slicker, more streamlined, and ultimately enjoyable experience – as well as to combat the growing competition of ecommerce front-runners. So, here’s a run-down of how Zara is using technology to gain an in-store edge, as well as what value it provides consumers. There’s no denying that Zara is one of the most in-demand retailers of the past few years. As of May 2017, it was ranked as the 51st most valuable brand in the world by Forbes, with sales increasing 13% to reach a record £602.7 million. This is pretty evident in Zara stores, hence my frustrating experience last year. Shops are typically packed, often resulting in long queues for the fitting rooms and even longer ones to actually buy something (or god forbid, make a return). In a bid to combat this, Zara has now launched self-service checkouts, allowing customers to skip the queue and buy for their items via do-it-yourself kiosks (à la Tesco). However, the technology looks and feels much slicker than your average supermarket. Since being made a permanent feature of stores last September, I’ve given it a go a few times myself, and have actually left feeling quite impressed. Instead of receiving the classic ‘unexpected item in bagging area’ alert, I enjoyed an intuitive and relatively easy-to-use experience. One of its best features is that it adds any item to your basket that you hold up in front of it (meaning no searching for or scanning pesky barcodes). David Cameron has said the thousands of new jobs Aldi has announced it will create in the UK, is a sign the long term economic plan is working. 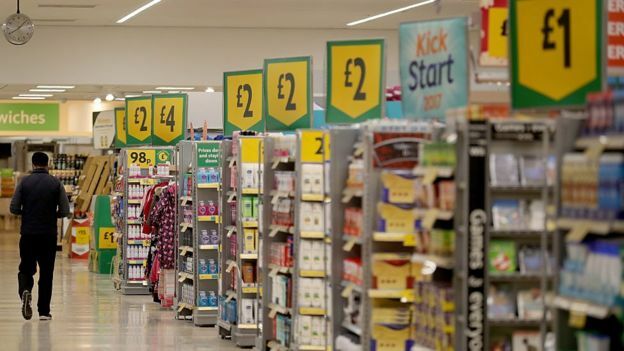 The supermarket chain is planning to create 35,000 new jobs in the UK over the next eight years. They will include management and office roles as well as store and distribution jobs. The German discount retailer wants to open 550 new stores across the country by 2022 , doubling the size of its UK workforce. In early June, Aldi began selling a-brands in Belgium. Initially it was about Coca-Cola, Kinder, M & M, Nutella and Lenor. Moments later followed Mars, Twix and Snickers, Axe and Dreft. In the meantime, we are finding more and more brands at Aldi, including Dash, Devos-Lemmens, Dove, Gillette, Gordon’s, Heinz … The range remains in motion, but what is the real impact? We asked Tom Padgett, client business partner at Nielsen. It is the initiative of the harddiscounter. “The introduction of A-brands was not an unexpected move by Aldi. It went a bit stiffer at the discount store for a while, there was little progress, partly because expansion slowed. Aldi, however, expanded opening hours. In the Netherlands, Aldi faced the same problems. In September 2012, the chain introduced a number of brands to reduce market share decline. Nach rund einem halben Jahr a-Marken bei Aldi ist die Bilanz positiv: Hartabsatz-Kunden müssen nicht unbedingt für ihre Lieblingsmarken in andere Supermärkte gehen. Was bedeutet das für den unabhängigen Supermarkt? Anfang Juni hat Aldi mit dem Verkauf von a-Marken in Belgien begonnen. Anfangs ging es um Coca-Cola, Kinder, M & M, Nutella und Lenor. Augenblicke später folgten Mars, Twix und Snickers, Axe und Dreft. Mittlerweile finden wir bei Aldi immer mehr Marken, unter denen auch Dash, Devos-Lemmens, Dove, Gillette, Gordon ‘ s, Heinz … Das Sortiment bleibt in Bewegung, aber was ist die wirkliche Wirkung? Wir haben Tom Padgett, Client Business Partner bei Nielsen, gefragt. Er ist die Initiative des Harddiscounters. “Die Einführung von A-Marken war kein unerwarteter Schritt von Aldi. Es ging eine Weile etwas steifer am Discounter, es gab kaum Fortschritte, unter anderem weil sich die Expansion verlangsamte. Aldi weitete die Öffnungszeiten jedoch aus. In den Niederlanden sah sich Aldi mit den gleichen Problemen konfrontiert. Im September 2012 führte die Kette eine Reihe von Marken ein, um den Marktanteilsrückgang zu reduzieren. Kun 9 kr for iPhone X, kan du tro det? Apple har skåret omkostningerne ned i selskabets nye iPhone Xs Max ved at fjerne komponenter relateret til displayet. Det viser en rapport, som TechInsights netop er kommet med, skriver Reuters. I komponentanalysen af Apples nye store iPhone Xs Max med 265 gigabytes og en skærm på 6.5 tommer fremgår det, at der i alt er komponenter- og forsamlingsomkostninger for 443 dollar eller omkring 2.800 kroner. Omkostningen i sidste års X-model med 64 gigabytes lå til sammenligning på 395.44 dollar eller omkring 2.500 kroner. Ifølge rapporten fra TechInsights, er den dyreste komponent i iPhone Xs Max displayet, som koster 80.50 dollar sammenlignet med 77.27 dollar sidste år, hvor iPhone X havde en mindre skærm. Den relativt lille forskel i omkostning på displayet skyldes, at Apple tilsyneladende har fjernet nogle komponenter relateret til sit såkaldte 3D touch-system. Funktionen der for eksempel sikrer, at apps reagerer forskelligt alt efter, hvor hårdt man trykket på skærmen. Alt i alt ser det ud til at Apple har skåret 10 dollar væk fra omkostningen af det nye display i iPhone Xs Max. Apple har ikke ønsket at kommentere sagen over for Reuters. En analytiker hos TECHnalysis siger til Reuters, at han mener, at Apple har set rigtig i forhold til at gøre den store skærm mere økonomisk i år. Apple annoncerede tre nye iPhones tidligere på måneden, herunder en opdatering af sidste års iPhone X, som nu hedder iPhone Xs. Like-for-like sales, excluding fuel and VAT, rose 4.9% for the six months to 4 August – better than the 3% increase for the same period last year. Second quarter sales were up 6.3% – its best result for almost a decade. Chief executive David Potts said Morrisons continued to become broader, stronger and more popular. The retailer said it had extended its “Fresh Look” programme to more than half its 500 stores, with significant improvements in product range and customer service, and developed its offers for online, wholesale, local and in-store services. Sales have now risen for the past 11 consecutive quarters and its online delivery service is available to more than three quarters of UK homes, including more parts of southern England and Scotland for the first time. Profits were hit by £51m of financial costs including £33m for a bond tender offer. The underlying pre-tax figure was 9% higher at £193m. Investors have been rewarded with a special interim dividend of 2p a share, sending the total interim dividend up 132% to 3.85p. Shares in Morrisons have gained pace this year but fell 2.4% to 259p on Thursday, valuing the retailer at just over £6bn. Richard Hunter at Interactive Investor said Morrisons had delivered more positives than negatives, but added that its “traditional weakness in terms of its convenience store and online offerings are still lagging in comparison to its larger rivals, whilst the proposed merger of Sainsbury and Asda will heap additional pressure on an already fiercely competitive sector”. Bryan Roberts at TCC Global said: “While praise is due for Morrisons’ underappreciated wholesale activities via Amazon and McColl’s – which still have plenty of headroom for growth – we have been deeply impressed with recent store visits, convincing us that the retailer is achieving genuine unique selling points in an otherwise largely homogenised market. Profit margins were flat at 2.5%, underlining the intensely competitive nature of the UK grocery sector. Somos Chanel & Stevo y llevamos más de 3 años viajando. Lo que comenzó como un sueño para ver como lo que este mundo tiene para ofrecer en un viaje de 1 año terminó siendo los dos viviendo en un nuevo país cada mes. Poco a poco nos abrimos paso alrededor del mundo 1 país a la vez. Sumergiéndonos en su cultura tanto como podamos. La forma en que viajamos ha evolucionado a lo largo de los años. Al principio nos ofrecimos como voluntarios, trabajando en lugares únicos como Husky Lodge en la cima de Noruega.Estas estancias fueron de 3 a 8 semanas. Tenemos algunas grandes historias sobre estos días. El segundo año fue una misión de jet set que rebota de un país a otro hasta 3 en un día. Queríamos ver una fotografía lo más posible y nos abrimos paso alrededor del mundo por segunda vez. Ahora, sin embargo, el objetivo de nuestro viaje es frenar un poco las cosas y permanecer en lugares por más tiempo. Todavía tenemos momentos en los que viajamos como locos durante una semana (eso es parte del acuerdo cuando ustedes son cineastas y fotógrafos de viajes como nosotros), pero ahora intentamos sumergirnos en una cultura durante 4 semanas y luego seguimos adelante. Como en todo estilo de vida, hay ventajas y desventajas y esto es lo que hemos aprendido y algunas de las cosas que hemos observado. El PROS para vivir en un nuevo país cada mes. Todo es nuevo. Todo el tiempo. Pasamos 365 24/7 juntos. Tener a tu compañero más cercano contigo todo el tiempo es una maravilla. Tener acceso a nuevos y diferentes tipos de productos. Siempre hay algo emocionante al entrar en un supermercado en un nuevo país. Japón viene a la mente como uno de los mejores. Tienes la oportunidad de hacer nuevos amigos de diferentes culturas. Nadie te conoce, eres un lienzo en blanco y puedes ser quien quieras ser. Tienes la oportunidad de ver cómo vive la gente del lado opuesto del mundo. Desde las remotas islas islandesas hasta hoteles en Vietnam. Tu mente está positivamente estimulada todos los días. Tienes que intentar aprender un nuevo idioma cada mes. Sí, se habla inglés en todas partes, pero hemos estado en muchas situaciones donde algunas palabras locales nos ayudaron. Pasamos 365 24/7 juntos. Es una estafa, así como un profesional. Todavía tratamos de hacer las cosas de manera independiente cada día, como hacer ejercicio o ir de compras, pero en su mayor parte estamos pegados. Tenemos que aprender rápidamente la cultura para comprender mejor el lugar en el que vivimos. El alquiler es alto. Cuando alquilamos un apartamento tiene un precio, ya que solo somos inquilinos a corto plazo. Camas incómodas y duchas pequeñas. A menos que nos quedemos en un apartamento de gama alta, no hay ninguna garantía real de que la cama sea cómoda y la ducha tenga un cabezal de ducha que funcione. Comer sanamente es difícil. Cada nuevo condado tiene diferentes productos y el almacenamiento de la nevera con todos los elementos esenciales para hacer una buena comida es más difícil de lo que piensas. Las relaciones sólidas son difíciles de conseguir y hay que despedirse pronto. Extrañas a tus amigos y familiares. Tener una rutina es casi imposible. Empaquetar y mudarse cada mes tiene su efecto en el cuerpo y la mente. Tratar con las conversiones de moneda y la banca a veces es confuso. Cambiar las zonas horarias desordena tu reloj corporal. Volador. Volar es muy agotador. We are Chanel & Stevo and we’ve been on the road for over 3 years now. What started as a dream to see as what this world has to offer over a 1 year journey ended up as the two of us living in a new country every month. We slowly make our way around the globe 1 country at at time. Immersing ourselves in its culture as much we can. The way we travel has evolved over the years. At first we volunteered our way around, working in some unique places like a Husky Lodge at he top of Norway. These stays were anywhere from 3 -8 weeks. We have some great stories about these days. The second year was a jet set mission bouncing from country to country as many as 3 in one day. We wanted to see an photograph as much as possible and we made our way around the globe for a second time. Now though, the aim of our travel is to slow things down a bit and stay in places for longer. We still have times were we travel like mad for a week (that’s part of the deal when you are travel filmmakers and photographers like us) but now we try immerse ourselves in a culture for 4 weeks at a time and then we move on. As in every lifestyle there are pros and cons and this is what we have learnt and some of things we have observed. The PROS to living in a new country every month. Everything is new. All the time. It’s hard to get bored. We spend 365 24/7 together. Having your closest mate with you all the time is a blast. Having access to new and different kinds of produce. There is always something thrilling walking into a supermarket in a new country. Japan comes to mind as one of the best. You have the opportunity to make new friends from different cultures. Nobody knows you, you are a blank canvas and you can be anyone you want to be. You get to see how people from opposite side of the world live. From remote Icelandic islands to box hotels in Vietnam. Your mind is positively stimulated everyday. You have to try learn a new language every month. Yes English is spoken everywhere but we have been in many situations where a few local words helped us out. We spend 365 24/7 together. It’s a con as well as a pro. We still try and do things independently each day like exercising or shopping but for the most part we’re glued . We have to quickly learn the culture in order to best understand the place we live in. Rent is high. When we rent an apartment it’s comes at a price as we’re only short term tenants. Uncomfortable beds and small showers. Unless we stay in a high end apartment there is no real guarantee that the bed will be comfy and the shower will have a shower head that works. Eating healthily is tough. Every new county has different produce and stocking the fridge with all the essentials to make a great meal is harder than you think. Strong relationships are hard to come by and you have to say goodbye way to soon. You miss your friends and family. Having a routine is almost impossible. Packing up and moving every month takes its toll on the body and mind. Dealing with currency conversions and banking is sometimes confusing. Changing time zones messes with your body clock. Flying. Flying is super tiring. Primark’s largest ever store will open in December 2018 at Birmingham Pavilions. Designed by 3DReid, the new store will showcase five floors of fashion spread across 14,864 sq m of retail space and will feature the latest trends in women’s, men’s and children’s fashions including footwear, accessories, lingerie, beauty and homeware. This store will build on Primark’s latest contemporary shopfit, offering an enhanced customer experience with bespoke design areas, access to free wi-fi and customer ‘recharge’ seating areas for enjoyable and convenient shopping. ‘The new Primark in Birmingham will be the largest in the world, offering an even wider range of our amazing fashion at amazing prices, over five floors. We have a loyal customer base in Birmingham and are very excited to unveil the new store, which will be almost four times the size of our current city centre store,’ says a spokesperson for Primark. The opening will create local employment opportunities, with almost 500 new jobs. The store will employ approximately 900 people in total, including 430 employees who will transfer from Primark’s current city centre location at Birmingham’s New Street. Argos launches its 3 for 2 toy sale on Friday but is it really the cheapest place to buy toys? The first Christmas retail advert of the year will be shown on our screens tonight. The war of the Christmas ads is about to begin, with stores such as John Lewis and Marks & Spencer spending millions of pounds to impress the public. But Argos has taken the leap of being the first retailer to share its festive offering on our screens, and you can watch it during Coronation Street on ITV, and Gogglebox on Channel 4 from 9pm. As reported by Belfast Live, the advert features a mischievous “fool” determined to ruin Christmas by causing chaos at people’s homes. The little creature, which has bells hanging from its long ears, breaks fairy lights and unwraps presents, as families desperately try to put the finishing touches to their festive preparations. The driver gives the pesky creature a swift boot into his van, where it lands among an army of its own kind, who have also been on a quest to ruin Christmas. Well, they can’t say they were not warned. In his first test at the Competition and Markets Authority, Andrew Tyrie is throwing the book at the proposed merger of J Sainsbury and Asda. From suppliers to shoppers, local to national, innovators and competitors, the CMA will be turning over stones. It has already found 463 locations “where there could be an issue”. The arguments over current market share have been joined, and Shore Capital’s veteran analyst Clive Black sees “a minefield of legalese and pseudo-academic analysis” ahead. This promises to be an exhaustive and exhausting process, and will not be quick. Yet in essence the question is a simple one: are Britain’s second and third-largest grocery businesses too feeble on their own to live with Aldi and Lidl? At first sight the answer seems self-evident. Both have larger market shares than either of the discounters, which should offer sufficient scale to keep them at bay. Both have established stores, while the discounters have to find locations. Ah, but not all the property is in the right place or the right size, and besides, Lildi’s UK operations are little more than cat’s-paws, and they use their continental muscle to scratch our supermarkets. The merger advocates have already played their strongest card, promising wonderful savings for Sainsda shoppers, thanks to scale and improved distribution efficiency. The CMA might consider this card a variant on the Find the Lady conjuring trick, and ask for previous examples where the consumer has actually benefited from megamergers. While nobody doubts that grocery is competitive, in such conditions everybody charges what the market will bear. And the idea that suppliers would welcome having to deal with fewer buyers is risible. The bigger ones are quite ugly enough to take care of themselves, while the smaller ones would find themselves in an even tighter squeeze than they are today.